Filed to: Fact Or Opinion?Filed to: Fact Or Opinion? On Sunday, Jalopnik picked up on some leaked images of the 2015 Jeep Renegade, the newest addition to the Jeep lineup that's just debuted at this month's Geneva Auto Show. From there, word of the Fiat-based small SUV quickly made its way around to other news outlets and forums like blotter sheets at Bonnaroo. Reactions to the Renegade — much like the 2014 Cherokee when images of it leaked out shortly before this time last year — have been polarized. Some adore it and its oddball chunky styling, while others who see it as an insult to the Jeep name because of its Italian front-drive origins would prefer to strap it to its own weight in Tannerite and use it as a giant Sparkling Fountain come this July Fourth. Regardless of whatever you might think, this diminutive crossover for cheapskates and first-time Jeepers seems surprisingly capable after you read the specifications sheet. And that's also where you'll start to notice something interesting unfold once you begin comparing it to the Cherokee. 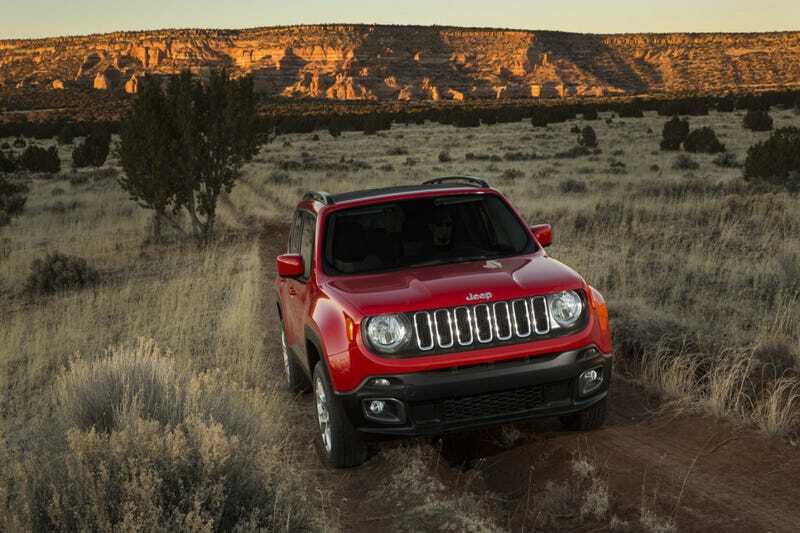 The Renegade in off-road ready Trailhawk trim has 8.7 inches of ground clearance. If that sounds familiar to you, that's because the bigger and likely more expensive Jeep Cherokee Trailhawk also has 8.7 inches of ground clearance. The Renegade's approach, breakover, and departure angles (30.5, 25.7, and 34.3 respectively) are also generally better than the Cherokee's (29.9, 22.9, and 32.2 respectively). The new Renegade shares it's four-wheel drive system (that can also pretend it's sorta kinda rear-drive), optional 2.4L four-cylinder engine and standard nine-speed automatic with the larger Cherokee. Dimensions wise? The Renegade is very close in size to the original XJ Cherokee more so than the Cherokee itself is — both the Renegade and the old XJ ride on a roughly 101 inch wheelbase, with the Renegade being just a bit shorter than the XJ and the XJ just a touch narrower than the Renegade. Even more interesting, there's the possibility that Renegade owners can install a small lift on their vehicle for added Rubicon Trail prowess. Cherokee owners, on the other hand, have been told everything but get bent. So here's the problem: if you're wanting an off-road capable crossover SUV, why on Earth would you buy the likely more expensive Cherokee over the Renegade? Sure the Cherokee is just a bit larger and offers the Pentastar V6 as an option, but if I'm to believe the press release in front of me, it's far worse out in the rough than the new XJ? Renegade. Hell, I'll be honest: now I'm sitting here wondering who at Fiat-Chrysler managed to mix the names of these two Jeeps up. Blake Noble manages Ignitionist.com, which you can find on Twitter @ignitionist. In less than a decade, he's owned more than a handful of derelict and less-than-devine automobiles, including two barely functional Camaros and an '80s Buick having a post-midlife crisis. That is, really, in no way impressive and is just plain sad, you're right. All hate mail, tips, and kudos can be sent to theignitionist@gmail.com. Thanks so much for reading!